Blurb: Very accessible, polished, and melodic, but gaudy in composition and production. If you can imagine Taylor Swift hiring :Wumpscut: to produce a record imitating Lady Gaga’s Monster LP, you have an idea of what this album sounds like. 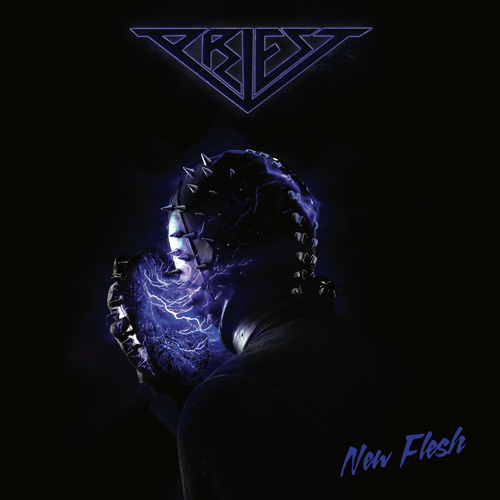 Obviously skilled performers and skilled pop songwriters, Priest make such facts well known on the New Flesh album. This record definitely fills the need of a talented writer approaching modern “dark pop” from a synth-heavy darkwave and electro/industrial mindset. This record is closer to industrial pop, if such a thing should ever exist outside of N*Sync covers and silly hats. That being said, New Flesh is not especially interesting beyond music for a dance floor party. I have to be clear though – this vocalist can definitely sing as evidenced by the harmonies, fantastic glides, complex musical phrasing, vibrato, and tonal choices throughout the album. To put it simply, Priest’s vocalist is amazingly skilled. Listening to New Flesh, this writer is reminded of early Apoptygma Berzerk in sound but with overproduced to Sleigh Bells levels of gaudiness without the depth and cryptical qualities inherit in Miller’s production choices. No, New Flesh overall is produced more to Janet Jackson or Taylor Swift levels of cleanliness, and that is the killer problem. Priest’s effort is effectively an ‘80s sound more reminiscent of “Sunglasses at Night” rather than a “Black Celebration” vibe. There’s a dark element here, but it doesn’t sound like a natural part of what is typically considered dark or gothic music; in effect, New Flesh sounds like an outsider trying to mimic. A major failure in this record, as previously mentioned, is that there is a definite desire in its production to create a near void of art-music class performance and audiophile tone, which ultimately (and unfortunately) passes up humanism to accomplish the goal. Every song on this LP is a crafted pop tune to draw in listeners, each under five minutes long. There really doesn’t seem to be much depth beyond pop for pop’s sake. The grooves tend to be a very stagnant 4/4 quantized danceable core with no diversion from an obvious clean-cut European style. Sadly, such accomplished musicianship appears to stagnate as it dwells in the comfortable. For listeners of Ghost, Apoptygma Berzerk, Corey Hart, AFI, New Flesh helps communicate the craft vs. art argument. This record is indeed craft, and by no means is New Flesh a bad record. It’s just the last record we need right now. It’s a digital, mechanical, rococo song cycle of nearly bubblegum pop.